3 years is not a short time for this couple to realize that difficult yet remarkable dishes are much better than regular common yet easy food that people can find anywhere. In 2014, Nam Queo’s wife enrolled in The Golden Spoon contest. The first time was not easy for all. She got nothing tangible but she knew what to learn and where to begin. Everything has significantly changed since the first time she was in The Golden Spoon contest. Her friends and relatives gave recommends and recalled good dishes from long time ago while she elevated them to the level of national contests. Nam Queo’s wife said that when she grilled sea-salted Lang fish (Bagridae), it just needed a pinch of fish sauce for all flavors to thrive. That moment lifted her mood up after an anxious time receiving the challenging black box. She thought that Lang fish was a lucky ingredient because she was so afraid receiving lobster. 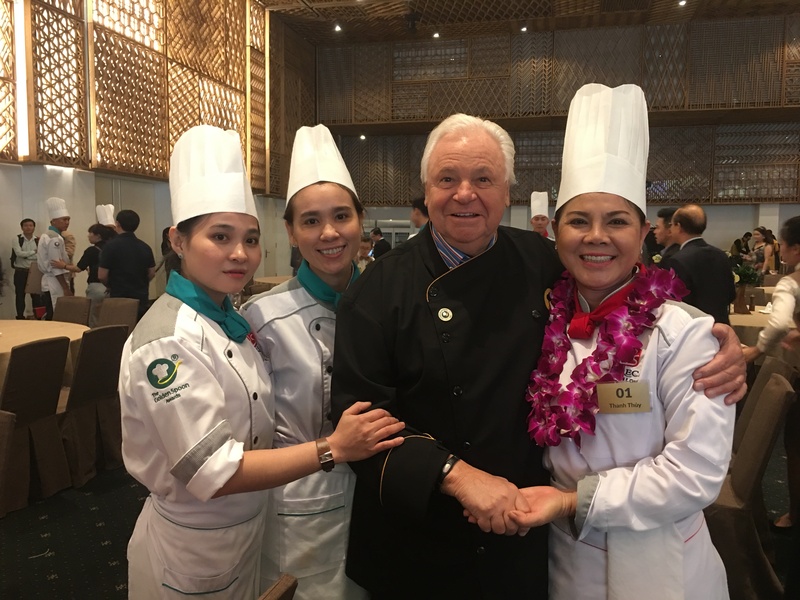 There were 15 teams in the final round, including all excellent chef from all over Viet Nam while Can Tho team – Nhi restaurant - was all female, including Nam Queo’s wife, her daughter and daughter in law. There dishes were Black Tiger shrimp salad with cucumber rolled tips of coconut tree, shrimp paste and banh phong (made from rice flour and shrimp), grilled sea-salted Lang fish in Lolot pepper and shrimp sauce; all were served with baked yam cake, grilled opo and egg plants over oiled scallion, and fresh herbal leaves. Without any responding, Nam Queo’s wife started singing a part of “Desire a lullaby” song (Author Nguyen Hoai Dan). Her eyes turned red because of crying when she sang. When I moved out, my mother gave me a couple of processions, a couple of pigs, and a pannier of rice. My father in law was so angry when I asked to move out because at that time, my family in law was gradually down after my mother in law passed away. My husband begged several betel trees for our new “tent” but they did not last long. Nam Queo’s wife had her lessons of life since she had helped her mother. She made money by selling cooked cassava, cooking wine, and raising pigs by the grain. From 2 original pigs, she had had a whole pigsty of 30. Selling the pigsty, she bought a wherry so her husband could do rice trading with the North. However, she felt not quite secure because of the big debt. She decided to build a home-style restaurant to make money. Nam Queo’s wife’s very first restaurant was at a papaya wharf. One of her first dish in menu is buff hot pot. She cooked it with fermented rice and feedbacks from diners were harsh. Opening 2 months but the restaurant almost had no customers. After that, indeed she met many Mr. Right, who happened to be her brothers in law. They brought specialties from their places to enrich the menu of her restaurant. “Actually, I couldn’t even fry a vole. A customer commented that my dish of vole was ridiculous and he told me how chefs in Hong Hoa restaurant fry a vole. I listened and I tried. The result came out just so good that customers had to admit that the vole was better that the most famous restaurant in town”, shared the very first lesson Nam Queo’s wife. After a year and half, the restaurant started to have frequent customers, who’d love to have a drink with the owner no matter what. The consequence was that Nam Queo had a stroke and his wife had to be in charged on the grand opening of the restaurant; she had to drunk 12 glasses of wine even though she must get up at 4am the next morning for restaurant preparation. Starting from rustic hometown, Nam Queo and his wife had moved to busy area for the restaurant 3 years then he got stroke so they’ve really struggled to maintain the restaurant and also their family relationship. At that time, the road was still rough and marshy, Nam Queo collected dozen buckets of soil and rocks to fill up those holes. “He predicted quite well about the expanding road so we expanded the restaurant as well. The debt was 1.4 billion Vietnam dong but we cleared it within a year. Now we wake up early in the morning and bike together, with our team”, happily said Nam Queo’s wife.